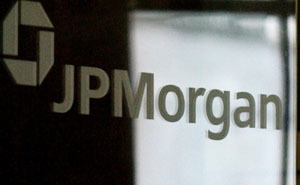 J.P. Morgan Chase & Co. cut its quarterly dividend by 87% to a nickel a share, a surprise move aimed at beefing up the bank’s capital cushion as the economy deteriorates and putting it in a position to potentially repay funds received from the government more quickly. …. [CEO James] Dimon said the decision, which came as the government is preparing to test whether banks’ portfolios can hold up under a severe economic stress, was voluntary and doesn’t reflect any unexpected problems in the bank’s results. In fact, he said the bank remains profitable more or less in line with Wall Street’s expectations. ….The reduction in the dividend will let J.P. Morgan hang on to an extra $5 billion a year — enough, Mr. Dimon said, to help the bank weather a scenario in which the recession drags on for two years, unemployment tops 10% and home prices ultimately drop 40% from their peak. JP Morgan has been widely viewed as the strongest of the big money center banks, so the fact that even they’re feeling nervous about their ability to pass Geithner’s test doesn’t bode well for the rest of them. It’s a smart thing to do, but it’s still a little unnerving that they feel like they have to do it.